Every year, the line between normal and critical winter performance in health and social care blurs. It turns every season into a permanent challenge for hospitals, associations and social institutions struggling to provide quality care to patients. However, due to regular seasonal increase in respiratory disease and injury, winter remains the busiest time in healthcare. Here are 3 major reasons of increasing pressure on hospitals, social and emergency care system during the crisis. And how digital healthcare takes up the responsibility to eradicate the root cause of the problem. Reason 1. Low Patient Engagement and Medication Adherence. These are not the newbies in healthcare. Nearly 75% of adults are nonadherent to their medical prescriptions in any way, according to the research conducted by the Polling Company. Mainly, it is caused by various reasons from inability to follow complicated procedures and drug prescriptions to costly treatment and doctor-to-patient communication barriers. Obviously, medication nonadherence leads to weak treatment results, which in turn, leads to increased hospital admission rate and higher demand of hospital beds and doctor visits. Moreover, yearly statistics confirms that low medication adherence causes thousands of deaths and billions of dollars in loss for hospitals and pharmaceuticals. Low patient engagement – another reason for increased hospital and emergency care calls – has a deeper background. Today’s solutions for patient engagement – mobile apps for patients, chronic disease monitoring, solutions for medication intake and patient-to-doctor communication, etc. - are intuitive enough for a savvy user. However, they still lack personalization for various demographics and patients with special needs (mental illness, speech or vision disorders). Designers of new healthcare solutions should focus on creating more agile intuitive systems that provide consistent cross-channel experience for patients regardless of their specifics: gender, age and special physical and mental conditions. What is more, advanced technology, such as deep learning algorithms should enable these solutions to adjust to patient’s immediate needs: shift between devices depending on time, place and schedule, adjust interface to patient’s requirements, make decision and take automated action in case of emergency. Good example of such next-gen solution is Dr. A.I. by HealthTap. This AI-powered system works on both iOS and Android mobile devices, web and even Amazon Alexa to provide users with immediate symptom-based health and wellness advice relying on the knowledge base created by more than 100k of doctors across various fields. Built with the best practices of digital empathy, Dr. A.I. dynamically personalizes questions and conversation flows and can adjust interface for the patients of different age and tech skills. Reason 2. Slow Treatment Process and Delays in Hospitals Discharges. Another reason why health and social care experience seasonal stress is trivial, yet complex to solve. Unautomated process of patient rotation, lack of patient tracking and inefficient exploitation of ambulance and paramedic resources snowball into delays in hospital discharges and emergency admission slowdown. Today, four-hour standard waiting time for patient is considered a target, according to the official response to the Health Committee Report on Winter Pressure in Accident and Emergency Departments (2017, UK). Even though the report claims that 95% of emergency patients wait less than four hours, underperformance of emergency departments against this ample standard during winter crisis remains a great concern. At present, it’s a patient’s safety that is at stake, not the failure to meet bureaucratic objective. Modern tracking and sensor technology in IoT systems should make game-changing impact on the problem of slow performance in health and social care. IoT-based patient and facility monitoring and management could become a forward-looking solution to underperformance of hospitals, ambulance vehicles and care centers. 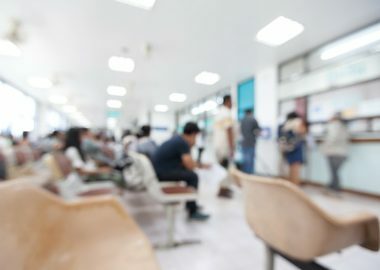 Despite bureaucratic barriers and substencial cost, healthcare takes strong position in introducing IoT technology into processes, according to Aruba research on IoT adoption. Globally, 60% of healthcare organizations have already introduced some IoT facilities to their process. Curiously, 42% of industry executives rank monitoring as primary use of IoT-enabled technology in healthcare. Consider IBM Bluemix-powered solution TMS able to clean the roads for ambulances via smart vehicle tracking and traffic management. Or successfully adopted CSIRO’s Patient Admission and Prediction Tool that analyzes big data to forecast hospital emergency admission with 93% accuracy. All together, adoption of IoT technology for patient traffic tracking, emergency performance monitoring and smart rout management for ambulances should accelerate traditional processes in patient admission and emergency care. Fortunately, first steps to cut four-hour standard have already been taken. Reason 3. Underfunding and Misplacement of Resources. “The sector needs to find better, long-term solutions to manage winter pressures. Joint planning and increased investment into the system is part of the solution,” London Council commented the problem of underfunding in terms of winter pressure in 2015. In 2017, even increased investment to combat seasonal crisis couldn’t placify the concerns of solving the problem with temporarily measures, instead of taking more forward-looking approach. Repeated short-sighted investment decisions put an important issue to the agenda of many local and health authorities. How to invest into reliable long-term solutions? Again, digital technology addresses this problem differently. Governments, hospitals, pharmaceutical companies and associations have long history of creating efficient digital solutions that require investment, but foresee efficiency and reduced cost. Electronic health records, electronic prescriptions, patient engagement solutions, doctor-to-patient communication apps, medication adherence tools, to name a few. Today, digital heathcare has enough capacity and capabilities to address the needs of health and social care with complex integrated solutions. Industry expects to adopt data-driven digital tools that operate across channels, integrate multiple technologies and provide innovative holistic approach to healthcare service. Phenomena of Kaiser Permanente - integrated care consortium that invested $400m to create fully-digital infrastructure across 38 hospitals and 651 medical centers - today reports mass adoption and hefty increase in patient engagement, telehealth visits, electronic prescription, etc. In all, web accounted for 52% of patient interactions in 2016, which means halved hospital visits, queues and no signs of winter pressure at all. Kaiser is a clear example of a forward-looking investment into the power of digital. Unlike the millions spent on temporary solutions yearly, such investment promises long-term efficiency. It allows not to decrease the pressure of seasonal crisis, but eliminate the core reason once and for all.